In a series of eight sessions, I guide you to discover your personal values, release limiting beliefs, and create scenarios describing who you are at your best. These scenarios then become the script that defines your goals as powerful intentions, allowing possibilities far beyond the ordinary. Your life takes on a new meaning, you begin to appear more authentic in your world, people respond to you in a positive way, and you create amazing results. You can learn one of the most Important secrets of successful living—how to set goals that reflect not just what you do, but WHO YOU ARE. 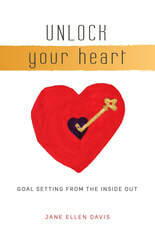 "Unlock Your Heart: Goal Setting From The Inside Out" is a guidebook that can help you to transform your life! I invite you to discover who you are at your best. Let go of resentments that are taking away your positive energy. Right now, is there someone or something you are resenting? A person or a situation that has hurt you or stopped you from achieving a goal perhaps? Think how freeing it would be to release that resentment and move on in your life! Discover your personal gifts and talents and begin manifesting those gifts daily. Create a life rich in passion and purpose. Communicate with compassion: people will listen to you and value what you have to say. Pause for a moment and imagine what it would feel like to have someone actually listen to you—to hear what you have to say—without interrupting you, without judging you or making you wrong! Imagine how powerful you would feel. Think of what you could accomplish! If you are longing for inner peace and a sense of authenticity, give yourself the gift of this guidebook! Then spend time experiencing the process and delight in the journey. Enjoy living a life you love. In a book club? Why not read a book that will change your lives? I am available to facilitate sessions for groups of people who buy the book to complete together. Find community, support each other, create accountability and have fun deepening your life's purpose. I offer sessions that guide you through each chapter and offer guidance, examples and feedback to make your time even more powerful, effective and fun! I work by phone and will soon be offering online group meetings via Google Hangouts. Please contact me for further information about getting started with your group. "Training ourselves to listen to internal longing takes practice. Most of us were not taught to pay attention to our deepest desire—the pearl within. Once we begin truly listening, we can experience what is being expressed within. Passionate self-expression propels us into creative action.” page 97.